Eleanore passed away Sunday January 20 at the age of 92 after a life well lived. Eleanore was raised as one of the middle children in the Saunders family of 8 children in Saskatchewan before moving with her family to Calgary when her father retired. Prior to marriage, Eleanore traveled with two other sisters across Europe on an extended trip which was one of the many highlights of her life. Married in 1956, she raised 7 kids mostly on a farm on Lochend Road in the Cochrane area. 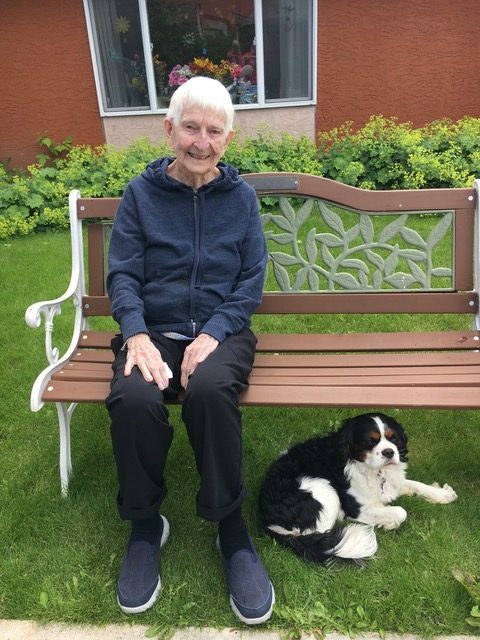 While living on the farm she raised chickens, sheep, cattle – learning to AI cows, quilt with the Lochend ladies, paint with the Cochrane Art Club, finding time to volunteer for Westbrook School and St. Mary’s church in Cochrane. As her children started to leave home, she took up downhill skiing again, then switched to cross country skiing and hiking. She was active into her 80’s both in Victoria and Cochrane belonging to senior hiking clubs. In 1980 Ken and Eleanore retired to Victoria BC where they owned and operated the Tudor Sweet Shop, then Eleanore’s in downtown Victoria for several years. They returned to Cochrane in 1992 to be with family. Eleanore is survived by her sons Doug (Marlene), Bruce (Robyn), Cameron (Jocelyne), Stewart (Jennifer); and daughters Susan (Duncan) and Louise (Hugh). She was a proud grandmother to ten grandchildren and 3 great grandchildren. Eleanore was predeceased by her husband Ken and son Howard. A celebration of Eleanore’s life will be held in the coming months. Our thoughts and Prayers are with Cameron and the Roberts Family, I know my Mom (Jocelyne) truly thought the world of Eleanore, and enjoyed every minute being with her at the home. My deepest condolences on your loss. Eleanor lived a good long and active life. My fondest memories of her time at Big Hill Lodge included her wit and humor, and her undeniable strength and determination to retain her physical and mental independence.